Digital native or digital immigrant – does it matter? The first seminar of NetIKX’s new 2013-2015 programme looked at the issues we all face in a technology-driven world. It combined two of our key themes: harnessing the web for information and knowledge exchange, and developing and exploiting information and knowledge assets and resources. As Karen reminded us, the phrase ‘Digital immigrants’ can be traced back to Marc Prensky’s paper, ‘Digital natives, Digital Immigrants’, 2001. This paper is free to download and there is also a follow-up Part2 paper. Prensky made the argument that the US education system was no longer fit for purpose for a younger generation born with new technologies exploding around them. ChemSpider – a free chemicals database which lets you search on a graphic, or even draw a chemical structure yourself and search on it. “Wonderful!” said Karen. Mendeley – a useful specialist search engine to find specific forms of information, for instance patents, hearings, television broadcasts or computer programs. WorldWideScience – pulls together information from a wide range of science websites and presents them in a visually appealing way. masswerk.at/google60/ – an amusing punch card style mock-up of what Google would have looked like in the 1960’s. Karen believes that the ‘digital native’ or ‘digital immigrant’ labels are not helpful and “we have far more useful things to worry about”! Using Google effectively, producing good digital photos – none of this comes naturally to any of us – we have to learn. The major issue for many of us is not going to be the technical side of using technology but the cost, which could lead to poorer people and those living in remote areas being excluded. Many parts of the UK still do not have broadband. School homework is often internet based now, with students expected to carry out research online – more difficult for children who have slow internet at home or no internet access at all. Under new government policy rules, jobseekers will soon be forced to sign up online with a job seeker’s website named Universal Jobmatch, or face losing their benefits (see this Guardian article, ‘Unemployed to be forced to use government job website’. Those without internet can use their local library – unless, of course, the library has been closed down! The Millennials may know how to use social media, but perhaps not in a work context. We tend to have an expectation that just by using the internet regularly, the younger generation have absorbed excellent web analysis and communication skills. This is not always the case. University lecturers often report that their students lack awareness of how to assess the validity of sources and construct their own argument in an essay. Perhaps the sheer amount of information available online has resulted in too much spoon-feeding. Ultimately Karen believes that it’s your attitude to technology that matters, not what technology you were brought up with. It’s down to personality – your level of curiosity and happiness to explore, an individual thing rather than an age thing. This is demonstrated by an interview on the BBC website with a pensioner who enjoys gaming – ‘Computer games keep me mentally active’. 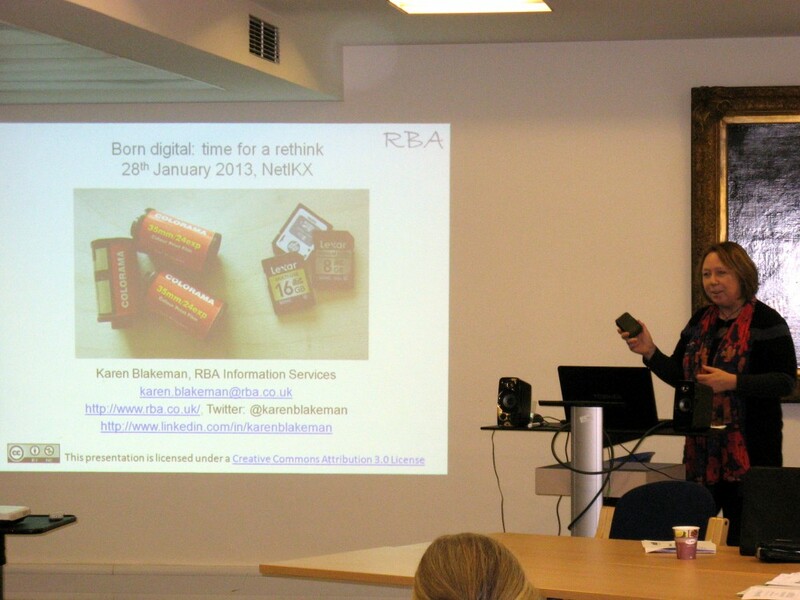 Karen’s presentation is available at slideshare.net/KarenBlakeman/born-digital. 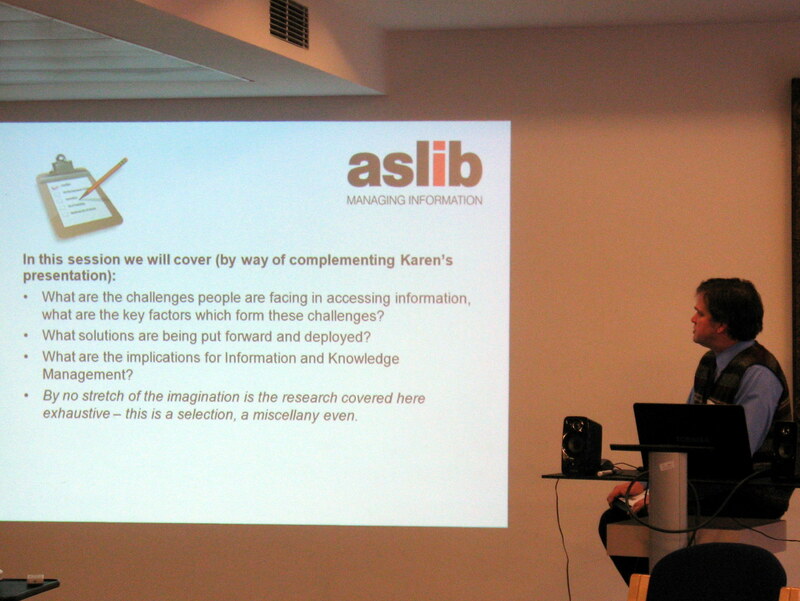 In support of Karen’s talk, Graham gave us an overview of research which has been undertaken into research behaviours – “Karen was the main course, I’m the pudding”. He told us he would present a “selection, even a miscellany, not exhaustive” of relevant research, taken from Emerald and ASLIB’s database of research articles. In this study, Ruleman analysed the demographic differences between faculty staff and students in terms of their social media use. She found that social media is by no means a youthful obsession, with both staff and students being active users of social media, just in different ways. Kilian, T., Hennigs, N. and Langner, S. (2012), “Do Millennials read books or blogs? Introducing a media usage typology of the internet generation”, Journal of Consumer Marketing, Vol. 29, No. 2, pp.114 – 124. ISSN: 0736-3761. ‘Entertainment seeking’ – the biggest group. Using social media for entertainment, but consuming passively, rather than creating new content themselves. ‘Highly connected’ – the smallest group, predominantly male, busy creating content such as blogs or videos, leading a very active digital life. Perhaps surprisingly, ‘information seeking’ was the main reason the surveyed Milliennials gave for using social media. Facebook are planning to enhance their search capabilities through their new Facebook Search service. Who needs Google+ or indeed Google if Facebook does search? This could create a situation where large groups of Facebook users never search outside Facebook. Vandi, C. and Djebbari, E. (2011),”How to create new services between library resources, museum exhibitions and virtual collections”, Library Hi Tech News, Vol. 28 No. 2, pp.15 – 19. ISSN: 0741-9058. This paper discusses lots of ways to link up traditional sources using mobile technologies. There is evidence that new technologies (mobile etc) can increase use of “traditional” library services in unforeseen ways. There is still a great need for a trusted intermediary such as an experienced information professional. This need has probably increased rather than reduced. Lack of access to technology, and lack of skill in its use, will increase disadvantages for certain user groups. Editing and curating, picking out the best quality information, is likely to become a sought-after skill as information overload increases. Graham’s presentation is available to NetIKX members at www.netikx.org. Our Storify collection of tweets from this event. Val Skelton’s event report for Information Today. This entry was posted in Developing and exploiting information and knowledge, Harnessing the web for information and knowledge exchange and tagged Digital natives. Bookmark the permalink. 1 Response to Digital native or digital immigrant – does it matter?